Cheemo pizza perogies, a.k.a. the pizzarogy. Growing up, I was very familiar with perogies. My next door neighbour in Winnipeg was an kind, elderly woman of Ukrainian descent, and she would regularly bring over Safeway bags full of homemade perogies. The fillings of choice in these yummy, starchy dumplings were usually (if I remember correctly) potato, cheese and cottage cheese. When I moved to Alberta, Cheemo perogies from the grocery store filled the perogy void in my life. I liked the typical flavours, but was dazzled by the oddball pizza perogy, a traditional perogy shell filled with potato, tomato, cheese and other pizza ingredients. Was it my first introduction to fusion cuisine? Possibly. And I liked it. 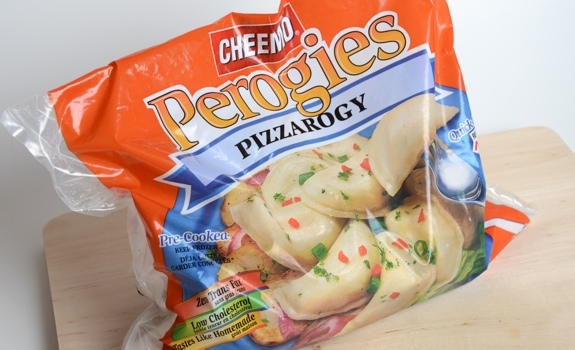 And now, after an apparent absence from grocery stores, Cheemo has brought back the pizza perogy, or pizzarogy, if you will. Saints be praised! The Pitch: “Real Potato. Real Cheese.” Also: “Zero Trans Fat, Low Cholesterol, Tastes Like Homemade.” Honestly, with a name like “pizzarogy,” these things sell themselves. The Look: Old school Cheemo bag, with a nice big photo of the prepared perogies. 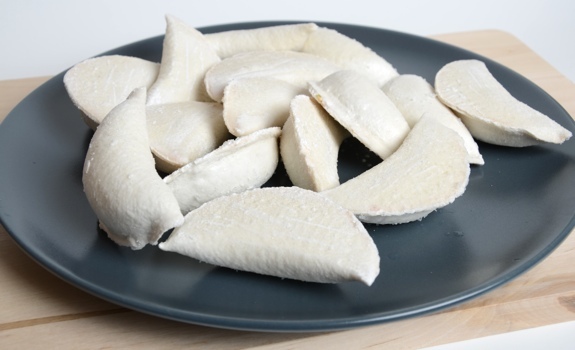 The frozen perogies look like frozen perogies: pale and puffy, shaped like a half moon. Cooked, they brown up nicely on the outside, and the filling is a vivid burnt-orange hue. The Preparation: Everyone has their own way to make perogies. Some folks zap them in the microwave, others boil them, and others pan fry them from frozen. Me? A combination: I zap them to thaw the perogies a bit, then I pan fry them with butter and a chopped white onion. You know they’re done once they acquire some nicely browned patches from pan contact, and the onions are well cooked. The Taste: Like I remember it. Mashed potato with tomato sauce, mozza, onion and Italian seasoning. The texture is mushy, but the flavour is great. It’s an unconventional perogy flavour, but it’s become an Alberta classic. I served them with some sour cream (full fat!) and real bacon bits. There’s nothing healthy about this meal, but it’s worth the extra steps I’ll have to put on my pedometer. Some Cheemo pizza perogies, cooked up with some onions, ready to be served. Cost: $3.99 for a 907-gram bag at Calgary Co-op. Availability: Not all that easy to find. Other flavours are more widely available. Nutrition? 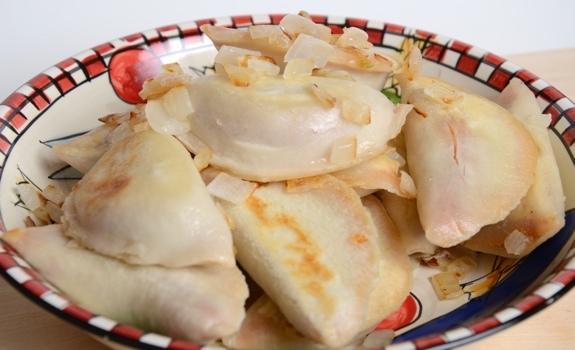 : Per 120 grams (4 perogies): 240 calories, 3.5 grams of fat, 320 mg of sodium, 2 grams of fibre, 8 grams of protein. Also, 15% daily value of both iron and vitamin C. Some calcium and vitamin A, too. The verdict: Pretty nifty. Kids should love it. A strange hybrid food that reminds me of growing up in Alberta. Before you cook 'em, perogies look pretty pasty, regardless of the filling. 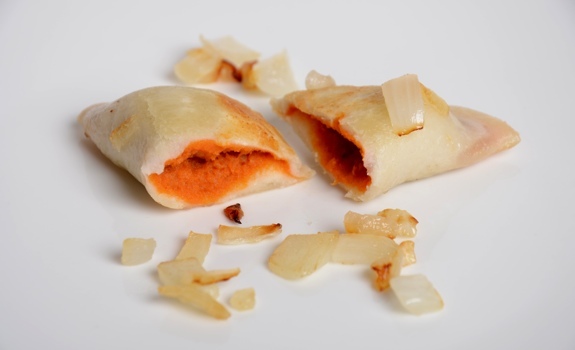 The filling in Cheemo pizza perogies is a distinctive burnt-orange colour. Omigosh – I lived on these years ago, during my teaching practicum. I’d stuff a bag in the staff room freezer and be good for a couple of weeks. I’d put 3 on a plate, bung ’em in the microwave and snack on them while grading papers over lunch hour. Now I have to go find a bag and see whether it’s possible for me to consume them without a red pen in hand. This sounds like it may be vegetarian. My first reaction is it must have meat in it, but by your description, it sounds like it might work for vegetarians. I’ll have to check it out at the store. I’ve only had the traditional perogies, but these ones sound interesting. Who knew? Yes,Yes,Yes. I loved these for years. I even called Chemo and asked them to bring them back. Everyone I know who has tried these, back when they were available loved them. They had excellent value, and tasted great. There is no meat element to these, or certainly none that i can taste. I’ve probably had close to 50 bags of these. I just got an email from John Biollo who works for Cheemo. He said that actually they weren’t bringing them back. Only one store in Canada has them, none of the major stores want this item. This article is misleading. And disappointing. I wish I could havetheir recipe. Well, they most certainly brought them back during the time when I bought mine. That was over a year ago now, and I’m not sure what has happened to them since then. Calgary Co-op was the only place I could find them, but Calgary Co-op is by no means a tiny store. I explicitly noted that they were not all that easy to find, so I’m not sure how that’s misleading. Did the person from Cheemo mention the name of the one store where they have the pizza perogies available? Purchased Cheemo potatoe and cheddar? Where’s the cheddar? Ingredients filled with ANNATTO food colouring. Great idea. Know what your eating! Perogy maker. Which Coop store in Calgary was stocking these? I guess the Cheemo fellow was mistaken, or maybe Coop brought them in on a trial basis or something. Ya Duane, I’ll sign your petition in a flash! Thanks for following up. Another update is in order. I used to be able to get these at the Brentwood Calgary Co-op location, but I haven’t seen them for quite some time. Certainly many months. There are lots of other Cheemo flavours available, but these appear to have vanished from the last place I could find them. Sadly, I think they may be extinct. Count several slices of bacon, count out 3x as many perogies – slice the bacon into 3rds so each slice approximately matches 1 perogy 😛 cut up onion/pepper/whatever and have some of your favourite seasoning on hand, I like basil and oregano, thaw perogies beforehand and cook the bacon 1/2 way just enough so all the yummy bacon fat is layering the pan, smoked bacon is better, then push the bacon aside and put in perogies – layering the bacon on top, so the perogies are now sandwiched in between cooking bacon fat on the bottom and hot bacon on top, I start to flip ’em a little, when confident they’re not going to stick to the pan or rip apart I toss in the onions and peppers…they cook quite quickly in the bacon fat remaining, and keep ‘er all mixed up, adding chives towards the very end. When plating I make sure I maintain that 1:1 ratio of bacon slice to perogy, cover in cheese then put in preheated oven for a couple minutes just to get the cheese nicely melted, problem is the plate is very hot after this – before eating I also spread lots of sour cream over the melted cheese…. ultimate perogies. Enjoy 😀 Thanks for the cheemo post, mouth watering, I really need to get some perogies somehow. When i lived in Hinton, Alberta they until Feb 2014 they had these in the IGA store there… I was in heaven beacuse i use to live on them as a kid! Mmmmmm i ate them straight for 2 weeks pretty much till my hubby told me i needed to stop or he would puke haha… Anyways i am back in Winnipeg MB now and craving my Pizzarogy…. I posted on a FB page and someone said they got them from Giant Tiger downtown not to long ago… needles to say im going to check today after work. Wish me goodluck! I loved these when I was a kid, and lately have only found them in co-op grocery stores and small independent grocery stores. But just recently I heard they were being discontinued. I still have 1 bag in my freezer. I don’t know if I’ll ever be able to consume them knowing it’s the last I’ll ever have of my precious precious pizzarogy. OMG, please please please bring back the pizzarogy, it’s the ONLY ones I loved!!!! It’s so sad that they decided to discontinue their best product. Nobody I know buys cheemo now because I had them hooked on the pizzarogy. Way to go cheemo.